Law clerks assist judges in making informed legal decisions. Contrary to the job title, law clerks actually perform very few clerical duties. They're sometimes highly skilled lawyers serving in one of the most prestigious and sought-after positions in the legal industry, but more often they're fresh out of law school after graduating at the top of their class. It can depend on the customs of the state and the court. Most judicial law clerks complete one- to two-year clerkship with a judge after completing law school. Some judges employ experienced law clerks as career clerks, however. They remain permanently on the judge’s staff. Law clerks at the trial court level are often directly involved in the litigation process if they've passed the bar. They assist the judge in courtroom proceedings, manage exhibits submitted into evidence, and interact with chambers staff, court personnel, litigants, and the public. 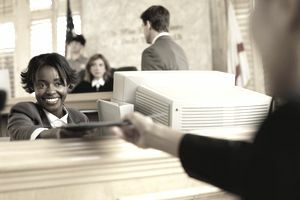 Trial court law clerks are often responsible for assisting the judge with settlement conferences and discovery disputes as well. They review briefs submitted by the parties to trial proceedings, verify cited legal authority, perform legal research, and draft a variety of legal documents including memoranda and orders. They might take witness statements, and even serve subpoenas. They sometimes act in a supervisory capacity over other chambers staff. They more or less catch all the tasks that judges don't have sufficient time for or aren't inclined to handle themselves. Appellate law clerks research and analyze complex legal issues in civil and criminal appeals. They also brief the judge and legal staff on the facts and issues of a particular case prior to oral argument. They'll often assist at judicial proceedings, but they can't play an active role in this regard until they've passed the bar exam. These clerks research and write bench memoranda, orders, opinions, and other legal documents. Other duties might include maintaining the chambers library and supervising chambers staff. Appellate law clerks tend to have a great deal of power because they make recommendations regarding the disposition of appeals and they can heavily influence a judge’s decision. Because of the academic nature of the work and the prestige associated with clerkship positions, superior academic credentials are often a prerequisite to employment. This means top grades, law review, and other academic distinctions. Many judges prefer law clerks with law review or moot court experience, and they often tend to favor those who show promise to go on and achieve remarkable things in the field of law. Many graduates serve as law clerks while they're studying for the bar exam. Judicial clerkships are highly research- and writing-intensive positions. Superior writing skills are necessary to draft concise, well-researched opinions, bench memoranda, and other legal documents. Excellent research skills and the ability to assimilate complex case and statutory law are essential. Law clerks must also possess a solid knowledge of diverse areas of the law, court procedures, jurisdictional rules, and the court system. They must possess strong communication skills and be able to work cooperatively with counsel, chambers staff, litigants, and often the public. Salaries can vary depending upon the clerk's experience, whether she's yet been admitted to the bar, locality pay adjustments, and the type of clerk position—whether it's career, term, or temporary. Some state courts historically pay more than others, including New York, Connecticut, West Virginia, Illinois, Oklahoma, North Dakota, Nevada, and Washington. A significant difference in pay exists between state and federal law clerks. Federal clerkships are the highest paying and most competitive positions. The median salary for all law clerks was just shy of $58,000 in 2017, according to the Bureau of Labor Statistics. Half earn more than this, and half earn less. Many law clerks have said that they learned more serving in this position for a limited time than in all their years in law school. This can be particularly advantageous if you already know you want to go into a certain area of law. You can apply for clerkships with courts who deal with the types of cases you're interested in, such as family law, criminal law, or tort law. The job also significantly dresses up a resume. Four Supreme Court Justices began their careers as Supreme Court law clerks. Typically, however, you must serve in a lower court before moving up to clerk for a federal court judge. The Federal Law Clerk Information System provides law clerk employment information. You can search a national database of federal law clerk vacancies.